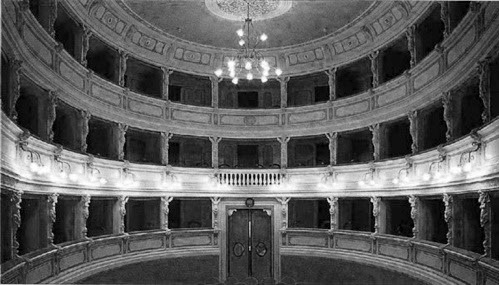 Located inside the Palazzo Pubblico, the Theatre has been used by the Academy of the Arrischianti since 1740. 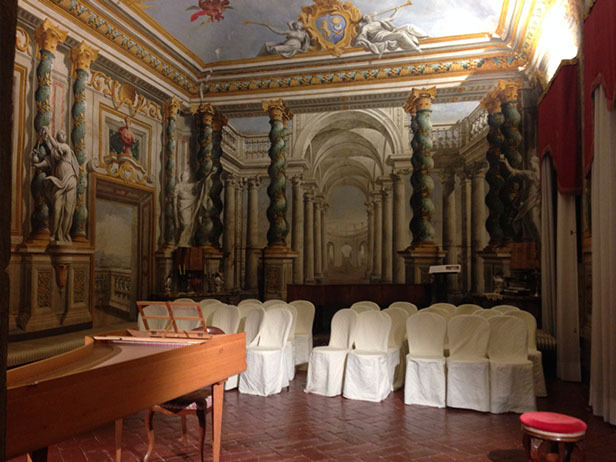 Although there is a record of an existing theatre in the 17th century, it is only in the 1700s that the hall is transformed into the classical “all’italiana” structure still visible today. Many adjustments followed later, the main ones by stucco worker Giannini. 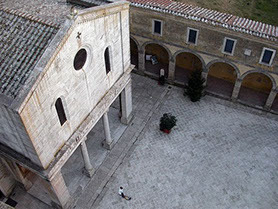 The Chiusi Duomo, cathedral of San Secondiano, was built in the 6th century and altered in the 12th century; the isolated bell tower dates to 1585, and was erected over a Roman cistern of the 1st century BC. Important restoration works were carried out in the church between the 18th and 19th century, and later in the last quarter of the 19th century – the latter, under the direction of Giuseppe Partini, included also the remake of the facade and its earlier Romanesque prothyrum. Inside there is a fine altar piece by Bernardino Fungai. Begun in 1691 by Giovan Battista Origoni, the construction of the church was continued by Andrea Pozzo and was finally concluded under Sebastiano Cipriani in 1712. A disciple of Andrea Pozzo, Evasio Colli, painted the trompe-l’œil inside the church, which also features stuccos on the walls and statues in stucco, by Francesco Notari and Bartolomeo Mazzuoli respectively. The paintings in the apse date to 1901 and are by Sallusto Tarugi. 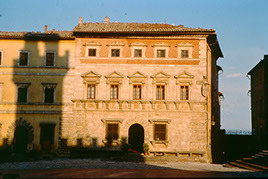 Palazzo Contucci is to be found in Piazza Grande, opposite the City Hall and alongside the Cathedral and Palazzo Tarugi. Started in 1519 by Antonio da Sangallo the Elder and commissioned by the Del Monte family (whose heraldic device is still visible on the right-hand corner of the building at first-floor level) it was probably completed by Baldassarre Peruzzi. The building rises above the remains of the earliest city walls, which explains the massive height of the back of the building. The first floor grand hall, opening onto the piazza, was entirely frescoed by Andrea Pozzo (1642-1709) in 1702. It is one of the few surviving examples of a profane cycle by the Jesuit from Trento, the undisputed master of Baroque illusionism. 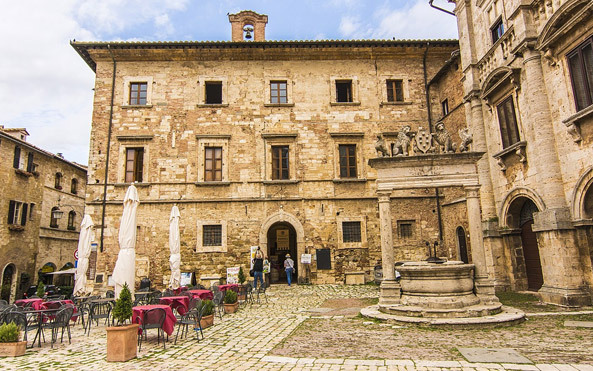 The Museo Civico of Montepulciano is located in Palazzo Nelli Orselli, a remarkable exemple of Sienese Gothic. It includes: the Crociani picture gallery (with its Caravaggio’s “Ritratto Virile”), a collection of Della Robbia’s terracottas, finds made of stone from Montepulciano and archaeological finds, a studiolo with Renaissance forniture; in these days it hosts part of the exhibition “Il Buon Secolo della Pittura Senese”. 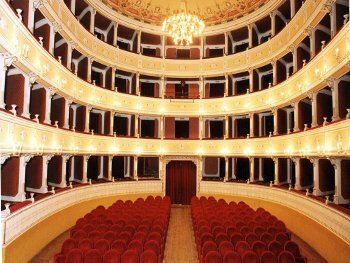 The Poliziano Theatre was built to a commission of the Academy of the Intrigati at the end of the 18th century; designed by Giuseppe Valentini, it was completed in 1796. Major modernizing works were undertaken by the architect Augusto Corbi together with the painter Rotellini and the decorator Franci; the last restoration project, financed by the City Hall, was carried out by architects Alberto and Giuseppe Samonà in 1980.